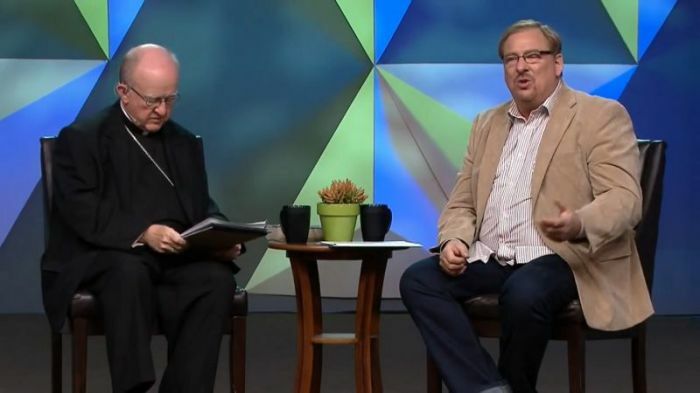 Megachurch pastor Rick Warren of Saddleback Church and California Roman Catholic Bishop Kevin Vann recently opened up about their years-long friendship and cooperation as a model for evangelicals and Catholics around the world to follow. Crux Now shared an interview on Thursday, which was conducted by Pia de Solenni, a lay Catholic theologian and chancellor of the Orange County diocese, where Vann explained that his friendship with Warren began five years ago when they met at his installation. "In the months and years that followed, I discovered the blessing of sharing the concerns of ministry with Rick, talking about our homilies and what we were both studying, and praying together. Our relationship has also been blessed to include Kay, his wife," Vann explained. "Also, Rick's staff at Saddleback and our staff at the Diocese began to get to know each other through various meetings, sharing not only our common love for the Lord, but also our love for the Church, fellowship, and praying together." Warren said that the two parties were committed to pray for each other, and shared that he invited Vann to his 35,000-volume ministry library. "Being surrounded by the books that the great Christian thinkers and saints have written in the past 2,000 years is humbling, and as we sat and prayed together in that library, we remembered that we are just two simple servants of God in a long line of Christian history, and that there will be many more in the future," the Saddleback pastor added. The commitment for mutual prayer grew in the wake of tragedies in each of their lives, such as the suicidal death of Warren's son, Matthew, in April 2013, and the passing away of Vann's father in November 2014. Besides supporting each other in dark times, the two church leaders also decided to work together to come up with initiatives to support mental health in the church. "Our discussions led us to ask how could the Diocese of Orange and Saddleback church work and minister together to address the challenges that families and ministry staff have in dealing with mental illness. Out of these discussions about working together, the Diocese of Orange and Saddleback church decided to partner in sponsoring two gatherings, or symposia, on what should be the Church's response to mental illness," Vann stated. "We wanted this to be both a reflection of the Lord's great love for those who struggle with mental illness, and we also wanted it to stress the importance of the Church's role in mental health," he added. Warren explained that out of his son's death "came a partnership in creating a conference to help others, and also a number of other mental health initiatives. It also brought Catholics and evangelicals together as I, and our church, received many letters of comfort from Catholic priests and parishioners." The bishop noted that the two friends have also worked together on pro-life projects, caring for immigrants, and opposing physician assisted suicide legislation in California. Vann and Warren suggested that their friendship can be a model for others. "At the beginning of Holy Week this year, Catholics and evangelicals in Orange County came together to pray for God's blessings on all our Holy Week services. So we who live here together also pray together. We've seen first-hand that much good can be accomplished for the Kingdom of God by Catholics and evangelicals being present to one another, praying for each other, and ministering to our communities together," the bishop said. Warren noted that union between the two traditions can open the eyes of nonbelievers as well. "Consider this: about 25 percent of Americans are Catholic Christians, and another 25 percent are evangelical Christians. That's about half of America! If just these two groups were committed to modeling the love of Christ together, imagine all the good that could happen," the Saddleback Church pastor stated. "Our prayer is that Orange County might be a model for others around the world." A Pew Research Center survey, released last month during the 500th anniversary year of the Reformation, showed that Catholics and Protestants today are not as divided on theological issues as they were centuries ago. The poll found that about half of Protestants in the U.S. now agree with the "historically Catholic belief" that both faith and good deeds are needed for salvation, rather than faith alone, though white evangelicals remained the strongest upholders of sola fide.